Glenohumeral instability is an intrinsic pathological condition of the shoulder, owing to its ample range of mobility that predisposes this joint to a somewhat limited degree of stability. Several techniques have been employed for the treatment of instability. Among these, one is the Latarjet procedure, recommended for cases of substantial bone deficit on the humeral head or on the anterior region of the glenoid. Such technique gives generally good, long-term results, considering the low incidence of recurrence. However, potential complications such as glenohumeral arthrosis, absorption of the bone block, breakage, malpositioning or mobilization of the screws, infections, neurological or vascular complications can be serious. Moreover, as a result of further severe trauma, the shoulder can become again globally unstable. In such cases, the question arises of which technique to employ in surgical revision, since the Latarjet procedure determines substantial subversion of glenohumeral anatomy. 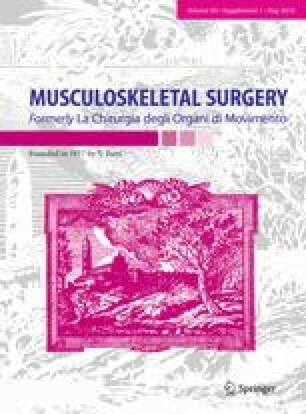 The aim of the study was the analysis of arthroscopical treatment after failure of a Latarjet procedure and to describe the related definitive results. During the period between January 2000 and June 2007, we treated 17 patients (18 shoulders) using arthroscopy, following failure of an open Latarjet surgical procedure. One patient was operated bilaterally. Clinical revision according to the Constant Score, ROWE, ASES, UCLA and the VAS scale for pain evaluation was carried out during follow-up examination after an average period of 5 years and 9 months (min. 2 years–max. 9 years) from latest surgery. The system of evaluation according to the Constant Score indicated an average score of 78.4/100 at follow-up examination; UCLA indicated 27.2/35; ASES 99.6/120; ROWE 75.2/100. With regard to pain, the VAS Scale indicated an average score of 2.9/10. As criteria for relapse, we considered classic cases of dislocation and subluxations, or sprains with subluxation, and subjectively experienced apprehension and pain to a degree that seriously inhibited the patient’s daily life. The incidence of relapse following the final surgical operation (taking into consideration both frank dislocations and subluxations) was 16.7%. At clinical revision, one patient showed dislocation due to relatively modest trauma ~1 year following the second surgery (5.6%). Episodes of subluxation or sprains continued in 2 shoulders (11.1% relapse). In 11 cases (61%), return to sports activities was achieved. Arthroscopy technique using anchors and sutures can, in selected cases, lead to satisfactory results, allowing, by means of minimal surgical invasion, identification and treatment also of intra-articular lesions, where associated.